The 70th Republic Day celebration, 2019 which was held in the state concluded with ‘Folk Dance Competition and Beating Retreat ceremony’ at 1st Bn Manipur Rifles parade ground in Imphal on Sunday. Governor Dr Najma Heptulla attended the ceremony as the chief guest and gave away prizes for various categories in connection with the 70th Republic Day celebration, 2019. Chief minister N Biren Singh, his council of ministers, chief secretary, DGP and high ranking officials, both from civil and police attended the programme. 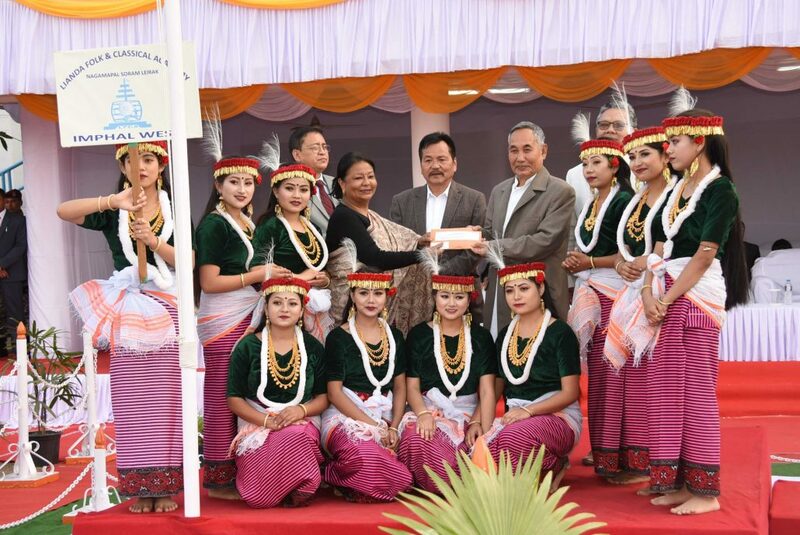 Lianda Folk & Classical Academy, Nagamapal Soram Leirak, Imphal West bagged the first prize in the day’s folk dance competition while Star Musical Centre, Khurai, Imphal East District and Chingu Thangjing Women Cultural Association, Moirang, Bishnupur District got the second and third respectively. 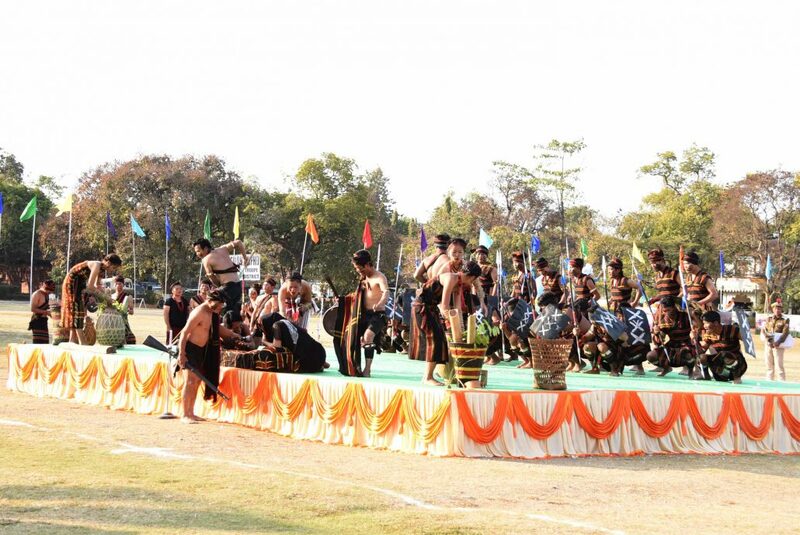 Altogether 17 cultural troupes participated in the competition. In the uniform contingent of the march past category, BSF and CRPF (Male) contingents jointly secured their place in the first, Meghalaya Police in second while Civil Police (Male), Imphal West and fifth IRB jointly secured the third place. In the women’s contingent, CRPF (female contingent), ninth IRB Mahila Contingent and Civil Police Female, Imphal West got the first, second and third position respectively. The 14th battalion of NCC senior boys & girls secured the first place in NCC group of the uniform category while 65 Bn Senior NCC Girls and NCC senior Air Wing secured the second and third place. Of the school contingent, Manipur Public School, National Sports Academy (Boys) and Poiroukhongjin High School jointly won the first position, while KGBV Andro and National Sports Academy (Girls) jointly won the second position and T G Higher Secondary School and second Manipur Rifles Unit High School (Boys & Girls) won the third. Assam Rifles Band, 2nd MR & 2nd IRB Combined Band and Sainik School Band bagged the first, second and third position in the band party contingent of the uniform category. For cultural troupe of the display category, Vaiphei Cultural Troupe secured its place in the first position while Tribal Cultures Research Centre, Noney and Tousem Namchi Youth Club, Tamenglong District stood at second and third position respectively. Relief & Disaster Management secured first position in Tableaux Display, Directorate of Information and Public Relations secured second while Office of the Chief Electoral Officer, Manipur and Tourism Department jointly secured their place in third position. Special Prizes were also given to Commandant, 1st Bn Manipur Rifles; Director, IPR, Manipur; Chief Engineer (PWD); Chief Engineer (PHED); Managing Director (MSPDCL), Commissioner, IMC; Parade Commander, AD/MPTC, Pangei; secretary, Rajya Sainik Board,Maipur; Secretary, Young Eagle Brass Band Association; Social Welfare Department (Differently-Abled Platoon); Secretary, Meitei Sana Leipak Sana Kangla Yek Taret; Secretary, Meitei Sana Leipak Kangla Lairembi Taret; Secretary, Indian Red Cross Society, Manpur; Nupilal and Khongjom War Memorial Society, Yaiskul and State Samvad Prabhari BST, Manipur State.